Rhubarb appears to look like red celery, but it has large leaves and is actually considered to be a member of the fruit family. The stem of the rhubarb plant is usually cooked and used in desserts, such as pie, but it can be eaten raw as well. Rhubarb is also available in frozen form, but choose one that does not contain added sugar, because it will have more nutritional value. Rhubarb offers many health benefits, and finding a way to add it to your diet can help you take advantage of them. Your diet should include plenty of calcium because it is a nutrient essential for the health and strength of your bones and teeth. Having adequate stores of calcium will help prevent softening of the bones as well as bone and tooth loss. One cup of rhubarb supplies 105 mg of calcium, which is about 10 percent of the 1,000 mg of calcium average adults need in their daily diet. 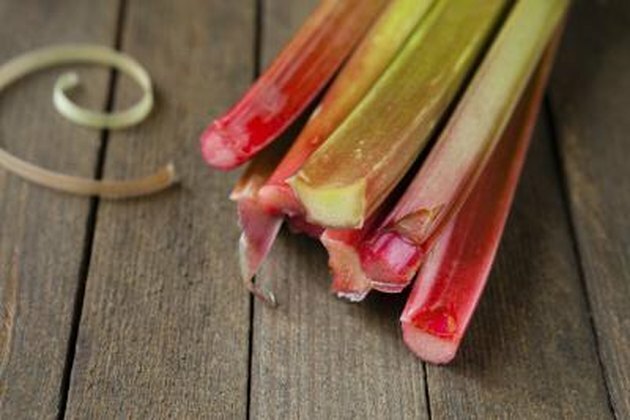 Rhubarb is also a good source of lutein, a compound that has many health benefits. Including plenty of lutein in your diet is a healthy way to take care of your skin and eyes. The Lutein Information Bureau reports that your skin and eyes are the only organs in your body that are exposed to the environment and need additional nutrients to keep them healthy and prevent disease. Lutein helps neutralize free radicals, which are dangerous compounds that can lead to cancer. A 1-cup serving of rhubarb contains 207 mcg of lutein. Another notable vitamin in rhubarb is vitamin K. Your diet should include sufficient amounts of vitamin K because this nutrient helps form blood clots when you are injured. If you have a vitamin K deficiency, you may have a more difficult time clotting your blood, which can lead to an unhealthy amount of blood loss in the event of an injury. One cup of rhubarb supplies 35.7 mcg of vitamin K.
The compounds that give rhubarb a vibrant red color are powerful antioxidants that can promote good health and help prevent disease. Roberta Larson Duyff and the American Dietetic Association report in their book, "American Dietetic Association Complete Food and Nutrition Guide," that red fruits and vegetables contain several beneficial antioxidants, such as lycopene and anthocyanins. These compounds help promote the health of your heart, eyes and immune system, as well as help prevent cancer. Cooked rhubarb supplies a good dose of lycopene, but raw rhubarb supplies none. Can You Eat Rhubarb Leaves? What Are the Health Benefits of Nectarines?